Regular Joe: 1916 And All That - There Will Be Bleurgh! 1916 And All That - There Will Be Bleurgh! * A short blog, this, in anticipation of the endless hours of debate, rows, screw-ups, disappointments, recriminations and Thundering Bollixology that will be generated by the 100th Anniversary of the 1916 Rising. It was announced in the budget that we will be spending €50m quid on this - which is probably around €49m too much. Cynics might say it's just a giant boondoggle for Official Ireland's favourite historians, pundits and arts mandarins - the Artistic-Industrial Complex. Truly, we shall ask - Was it for this? What's that loud noise, we hear rumbling towards us like a Crossly Tender full of vengeful British Tommies!? "The Basterin' 1916 Commemorations Oh Jaysus Christ Are They Ever Going To Shut Up About This Shite?" For while we can't say for certain where our crazy little Republic will be by the time Easter 2016 rolls around, we can say one thing without fear of contradiction - by the time we get there, even mentioning the words "Easter" "NineteenSixteen" or "Padraig Pearse" in a pub in Ireland will get you a quick poke in the jaw. And on your way out, a rapid funt up the hole. Oh God. It's going to happen. We are going to flog this horse to death, re-animate it, flog it some-more and then hang, draw and quarter it outside the GPO. We don't - at official level at least - have the wit or imagination to do anything else. We won't be able to help ourselves. The Government, our Chattering Classes, our professional People Of Important Thoughts and the History Boys are going to bore the living arses off us with endless, mind-numbing bollix about what this means for modern Ireland, the legacy, the lingering trauma of insurrection and civil war, neighbour-against-neighbour, brother against brother and fish-monger against plumber. "Ye Stay Here Lads, I'll, er, Cover Ye From The Biscuit Factory. For three days"
We'll overdo it. Because we feel we have to give it the full nine yards. It was quite an event after all. And sure didn't the Brits do a great job on commemorating WWI? We'll just have a look at what they did and bob's yer uncle. Get Macnas on the phone, somebody feed seven gallons of RedBull into Diarmuid Ferriter and for God sakes make sure Fintan O'Toole is kept sedated because we are going to need him before this campaign is over. And get me a Bowman. Two if you can find them. The poor people of Ireland will be battered into submission by endless books, think-pieces, docs, analysis, dodgy recreations and protestors standing outside the Dail with badly drawn signs asking "Was It For This, That Connie Markevic Gave His Life?" Meanwhile, the Gov will try to make it some inspiring celebration of cultural diversity and inspiration and togetherness and...er..do you think we can get a couple of quid out of Google to cover the sandwiches? They already have a hashtag and everything! #IrelandInspires ! And if that don't inspire you to write a letter to Queen Liz II, asking for readmission, nothing will. And for what? 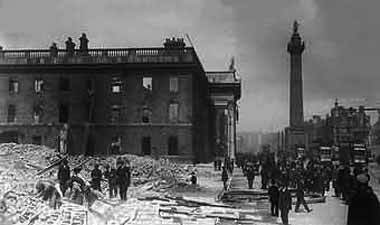 What was 1916 but an ill-thought out military farce, run by a rag-bag of poets, socialists, religious nutters, arch-conservatives, heroes, zeroes, fools, patriots and a few people who happened to wander in to the GPO in search of a postage stamp and ended up fighting the British Empire, by mistake? It was the latest in a long line of glorious failures. But it succeeded. Kinda, sorta. And only after another two awful wars and the long drawn out insanity of The Troubles. For the 50th anniversary, there was a big military parade down O'Connell Street, a few speeches and the traditional Rounding Up And Jailing Of The Fallen Women (always a popular one, that) and we just left it at that. So what should we do this time around? Well, if you were asking me (and nobody in their right mind would) there are plenty of great stories around 1916 that fully deserve to be told. Not the usual guff about Padraig Pearse and the precious blood of Irish patriots - or what 1916 "means" to Ireland 2016 (Feck All) - but the stories of actual human beings of all shades and denominations. And for the Big Stuff - Do a parade on the weekend in question - get our soldiers who have served with honour with the United Nations to march. Get the Orange Order down (why not, they were a part of the times too and they've loads of experience with parades). Have an interdenominational service. Fly the flags at half mast. And maybe ask what happened to the ideals and the vision of Ireland held by people like James Connolly. And Michael Collins (blessed be his name). And forget this touchy-feely, expensive YouTube ad campaign #IrelandInspires bollix. Because that's the fake stuff. The ersatz, Best Little Country In the World shite that fools nobody. Not even the tired cynics and marketing men who are paid ridiculous amounts of money to throw it together. Especially not them. Commemorate all of the men who died, yes, the Tommys too, because most of them were just kids from the slums of London, Liverpool, Newcastle and Glasgow. And maybe do one more thing - do a national essay competition (written, audio or video) for every school-kid in Ireland. Ask them what Ireland means to them and what they want for their future. Because I can tell you one thing now - it ain't a jaded, cynical social media campaign that says #IrelandInspires. * hey! Thanks for reading, and don't worry, I'm not off my meds.